Image Transfer Review: Presented in anamorphic widescreen with its original 2.35:1 ratio intact, The Omega Man transfer features above average clarity, true colors and excellent contrast. The source material possesses a few noticeable specks, but is clean overall, with vivid detail in both day and night scenes. Fleshtones suffer from a slight red push and the chalky make-up of Matthias and his crew comes across as theatrical rather than creepy, but such faults are minor and forgivable. For a thirty-plus-year-old film, The Omega Man looks surprisingly spry. Audio Transfer Review: The workmanlike Dolby Digital mono track performs as expected, providing a pleasant but limited sound field. Aside from intermittent machine gun fire and a few explosions, sonic activity is fairly tame. Both dialogue and Ron Grainer's music score come through cleanly, and any age-related defects have been properly masked. Extras Review: Warner continues its commitment to the classics by producing new supplements and rummaging through studio vaults for rare material. The extras for The Omega Man reflect this attitude and, though not extensive, nicely compliment the film. Aside from a cast and crew listing and original theatrical trailer, a new four-minute introduction to the film featuring screenwriter Joyce H. Corrington and actors Paul Koslo and Eric Laneuville provides some background on the roots of The Omega Man as well as a few nostalgic memories. Laneuville recalls the "overwhelming" experience of acting with Heston, who he remembers as "gracious and kind," while Corrington discusses the film's "racial pizzazz," and Koslo appreciates Heston's deadpan one-liners. 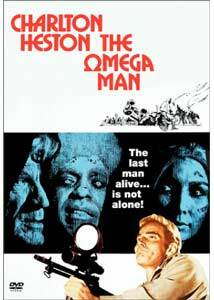 The Last Man Alive�The Omega Man is a 10-minute featurette filmed during production in which Heston discusses the film's plot and ideas with noted anthropologist Dr. Ashley Montague (who?) on the set. Some behind-the-scenes glimpses of set-ups and shots add interest to this otherwise bland promo piece. Finally, the essay Charlton Heston�Science-Fiction Legend briefly examines the actor's contribution to the genre through such films as Planet of the Apes, The Omega Man and Soylent Green. The Omega Man enjoys a strong cult following and admirers of the film will rejoice over its DVD presentation. In addition to a slick anamorphic transfer, Warner includes a decent set of extras to round out the package. Although more than three decades old, The Omega Man remains taut and relevant (despite its "living dead" villains), and while the story looks into the future, it's fun for the audience to take a gander at the past. Germ warfare may easily wipe out humanity, but it seems nothing can ever kill the style of the '70s.